The seven colored earth is a natural phenomenon and a prominent tourist attraction. The colors evolved through conversion of basaltic lava to clay minerals. millennia, the rocks were pulverized into sands which have the amazing property of settling into distinct layers: if you take a handful of each of the seven different colours of dirt and mix them together, they'd eventually separate into a colourful spectrum, each dot of sand rejoining its colour caste. The Colored Earth of Chamarel has become one of Mauritius' main tourist attractions since the 1960s. Nowadays, the dunes are protected by a wooden fence and visitors are not allowed to climb on them, although they can look at the scenery from observation outposts placed along the fence. Curio shops in the area sell small test-tubes filled up with the coloured earths. 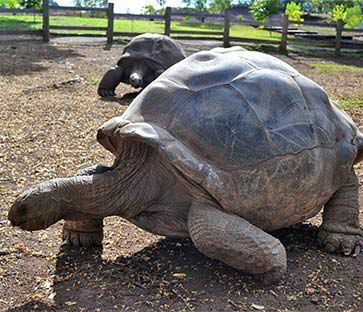 On the premises, you will also find a children's playground and some giant tortoises.